and global definitions for the "City of God." The Scientific Translations of Immortal Mind, and Mortal Mind, together, form 4 layers of thought. 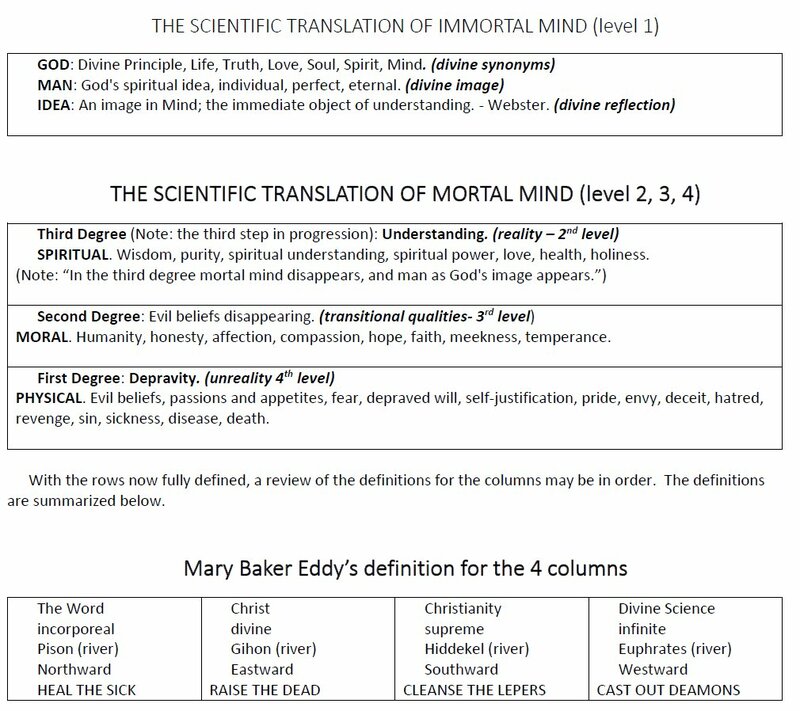 In this context the Translation (originally called definition) of Immortal Mind, adds a significant definition to the top row of the city of God, while the three-part Translation of Mortal Mind pertains to the lower three rows. The process expands the definition for the 4 rows. This renders the second row, the row of the Christ, coincident with spiritual understanding, and the third row, the row of Christianity, coincident with all that is moral, which Mary Baker Eddy has defined as transitional. With this row being transitional, it can trend either upwards or downward. The transitional quality at the center, effectively splits the entire 3-row structure as a translation of mortal mind into two halves, an upper half and a lower half, so that the "City of God" becomes functionally a three-part structure. This is essentially the division that we see in Christ and Christmas, in the scene "Christmas Eve". 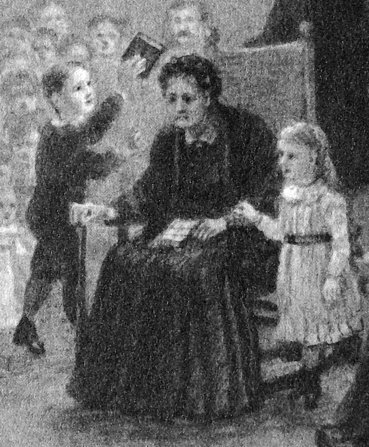 In the scene we find the woman representing science as an old woman in a rocking chair, as Mary Baker Eddy was seen in the context of theology and medicine. In her lap, we find a tablet of three horizontal divisions, a smaller one on top, representing the top row, and two larger ones below representing the three lower rows split down the middle as an upper and lower half. The illustration in which the scene is located, coincides sequentially with the textbook chapter "Science, Theology, Medicine" that contains the scientific translations of immortal Mind and mortal mind. The cover-image of Christ and Christmas features a 7-pointed star, surrounded by 56 rays of light. 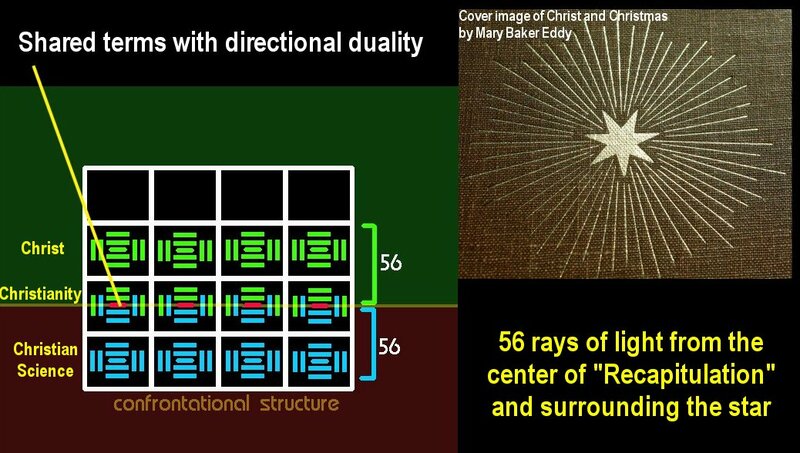 When one divides the lower three rows into half, with the central terms shared as a pivot, each half contains 56 parts, which is the number of rays of light surrounding the star on the cover of Christ and Christmas. The division down the middle divides the lower three rows into two halves. This accords with the definition of the row of Christianity being "transitional" - Either being oriented towards the Christ, or away from it which Christian Science is able to overcome and correct. The center division effectively divides the chapter "Recapitulation" and its associated Lesson Topics into two contrasting parts, pivoted on Christianity as "transitional." 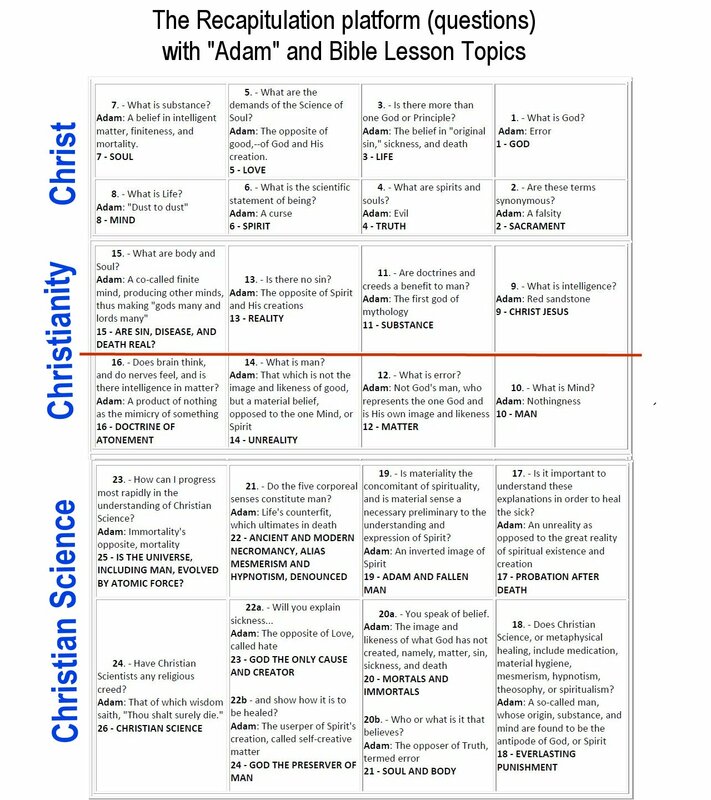 Because the Lesson Topics and the definitions of "Adam" are linked to "Recapitulation" all become divided into two halves as the chart below illustrates.